You have a lot of time, planning, patience and creativity in that wonderful piece. First, you created it to perfection. Then you took a myriad of pictures of it to capture it at just the right angle in just the right light to make it look its best to prospective buyers. Now it’s time to list it. So you write a wonderful title for this newest creation. The question is, can search engines find it? One would think the title would be easy… it is what it is, right? A title is nothing more than a short, concise description of the piece. But people are so different and the way you would describe a piece in your title may have nothing at all to do with the way someone else would describe it. It all comes down to what people are searching for. According to our friends at Trustnav, Search Engine Optimization (SEO) is crucial in your title. What the heck is this? Simply put, SEO is the language search engines (like Google) use to come up with that list you get when you search for something on the internet. You might think you need to become an expert in this technical area, but it is really only important to always remember that it is there. Instead of thinking in terms of a literal title, think like a customer who might be interested in purchasing your piece. What words might those folks use to find what you are selling? Let’s look at a specific example. Here is a yellow headband from my shop. A good title for it might be Ladies Yellow Headband. But that isn’t good for search engines. For one thing, it’s too short; their are only three words for a search engine to find. Thinking like someone who might buy this, I might search for yellow knit ear warmer or even handmade knit headband for women or knit yellow hat. 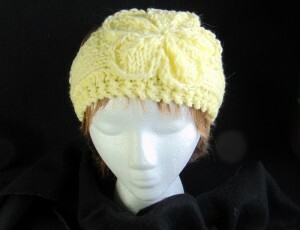 So should my title be Yellow Knit Headband Hat Women Ladies Ear Warmer Handmade Hand Knit? The answer is emphatically NO! Even though it is of critical importance that search engines can find your listing from the title, the title should be written for humans – a human is the ultimate consumer of your work! You need to split the difference – so to speak – between what a search engine might find and what a human might have used for search terms. Keeping this in mind, a good title for this item might be Yellow (because people often use a color in their searches) Hand Knit Ladies Headband to Keep Your Ears Warm in Style. Be sure to use all of the words that you think someone might use to search in the first and/or second sentence of your description as well. This will drive the message home to search engines of exactly what your item is and what you are saying about it. Great post! Shared, this is really important!